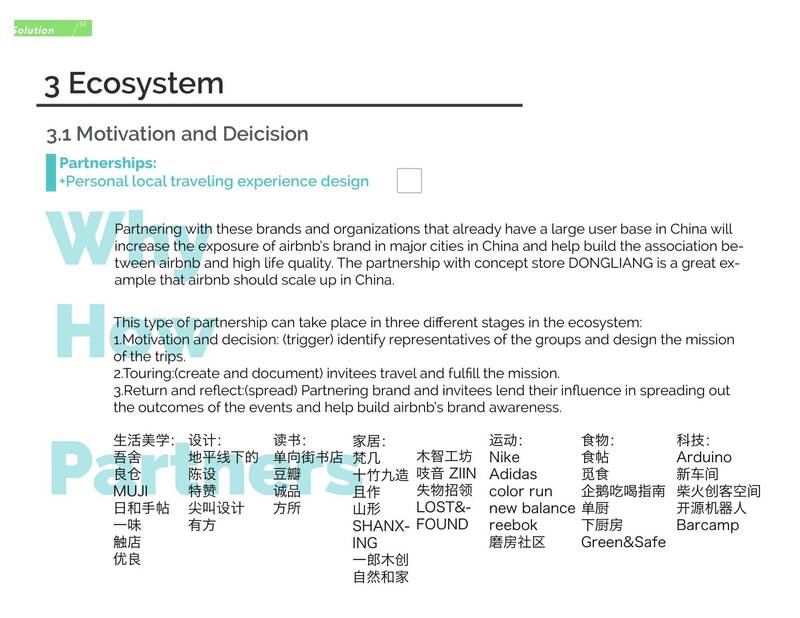 An independent contracted design consultancy project for Airbnb China to help them understand the user base in-depth, and design localization solutions for Airbnb China to enter the market and grow the user base in China. Confidential information has been removed in order to comply with the NDA. Back in 2015, Airbnb was new to China (they didn't even have a Chinese name), and the sharing economy was still a strange idea to most Chinese consumers. To localize Airbnb in China was not only a business challenge, but more a cultural one. Using the results from the cluster analysis, we spoke to Chinese travelers that are representative of that segments to learn about their thoughts, feelings, and reasoning at every step of an outbound trip. These hours of recordings and were then converted to post-its and ended up on user journey maps. 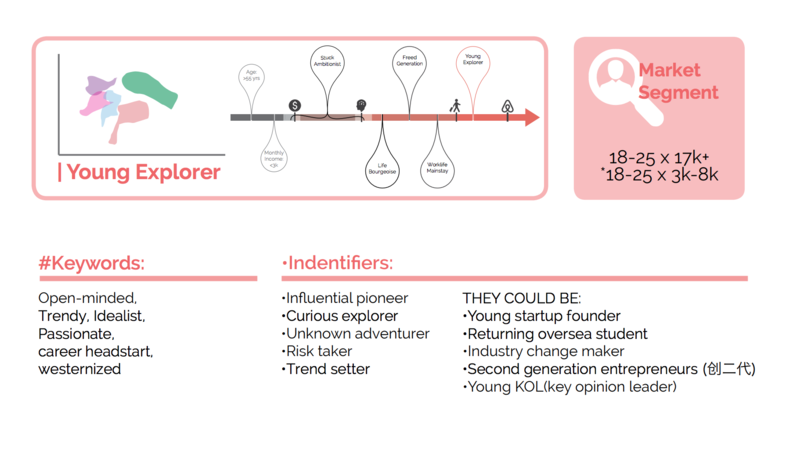 Synthesizing the insights we obtained from the research, we developed a persona for each market segment and produced detailed descriptions and user journey maps. 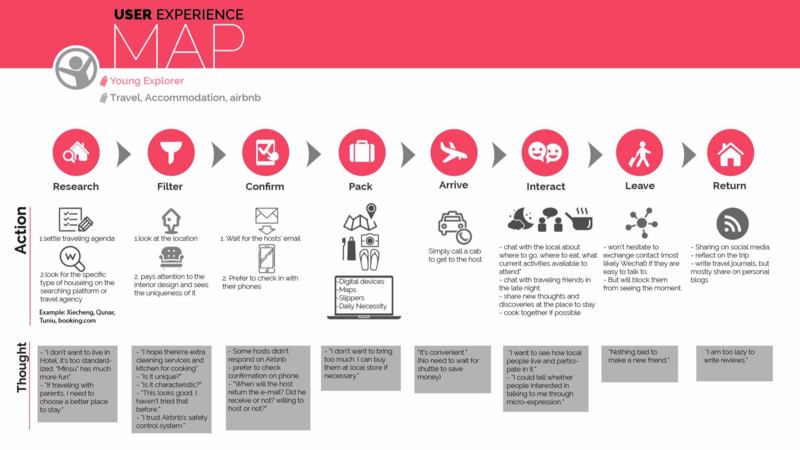 We especially paid attention to how "compatible" the persona is to Airbnb's concept and spirit. 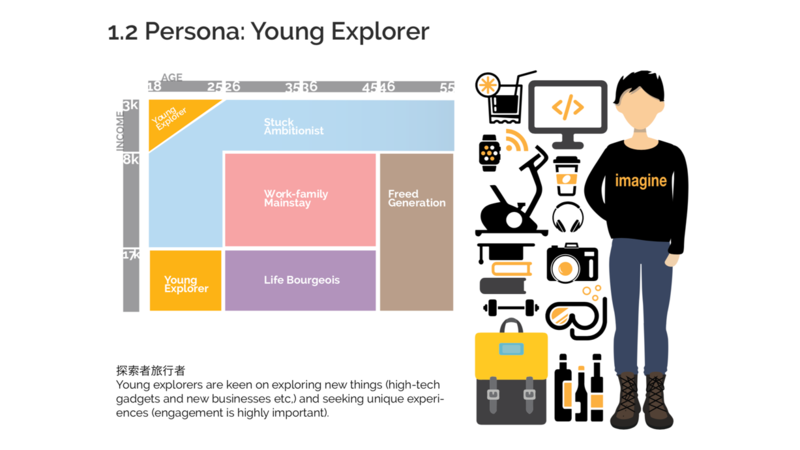 Below is an example of user archetype, "Young Explorer." Accommodation is an essential part of the traveling experience, which is an epitome of lifestyle.Airbnb’s message needs to be greater than one from a housing platform, but a call for people to adopt a more open, explorative travel style. 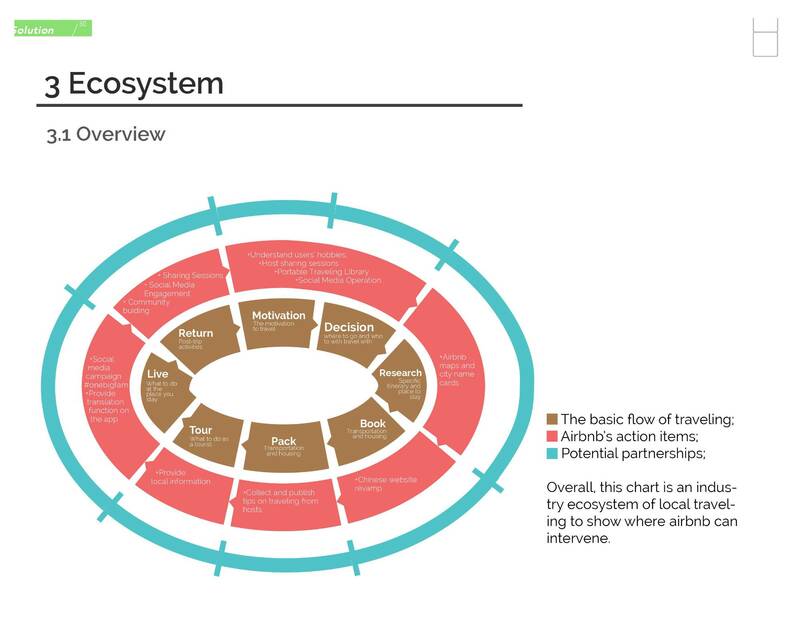 Therefore, we approach the travel industry as a complex system of multiple agents and came up with an eco-system framework to propose solutions for Airbnb to establish its iconic lifestyle brand in China. 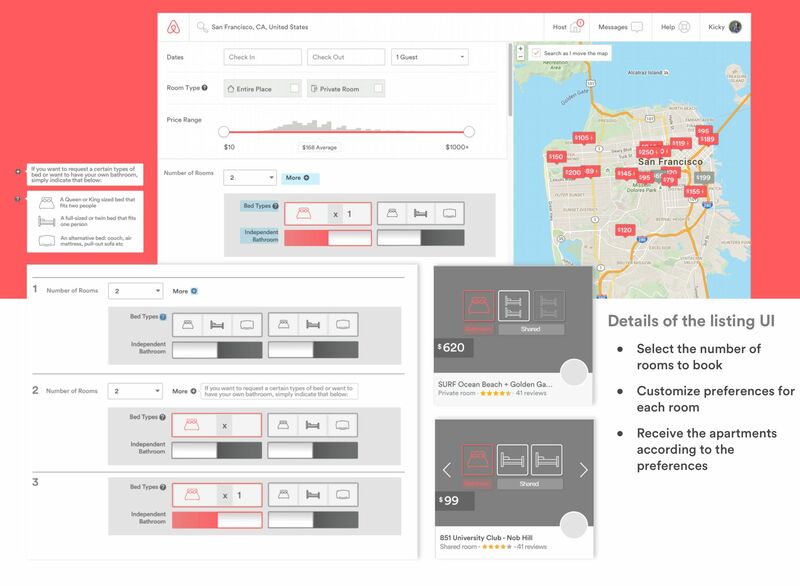 As an aspiring product designer back in 2015, I also proposed ideas to localize the product to suit outbound Chinese travelers better. For example, since outbound Chinese tourists usually traveled as a family unit, with the kid(s) organizing the trip, one scenario that came up frequently was the need to find apartments that have rooms with different criteria (the parents usually have different requirements than the kids). I, therefore, proposed to add a filter to achieve that. 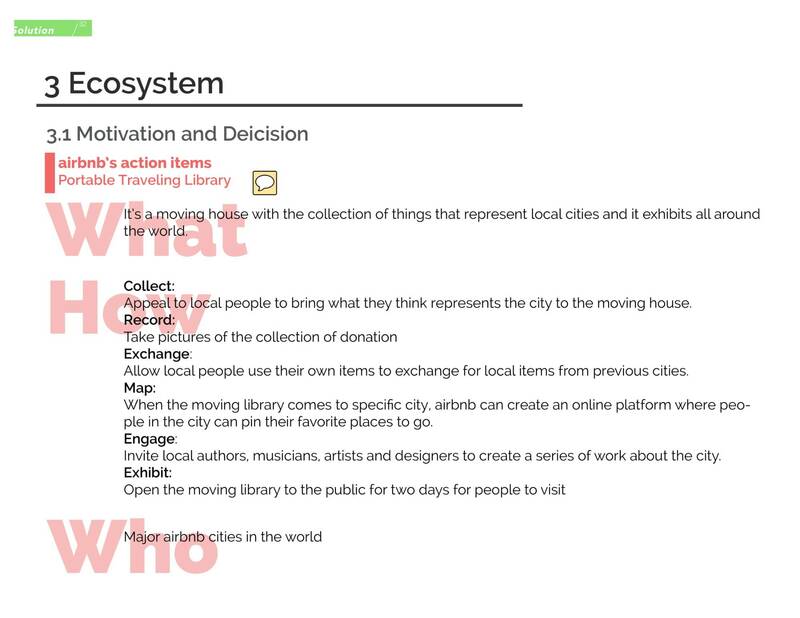 Another example is the idea of Shairbnb, a feature designed to facilitate socialization and community building. Young Chinese outbound travelers were interested in the social aspect of Couchsurfing but lacked trust in such a free platform. 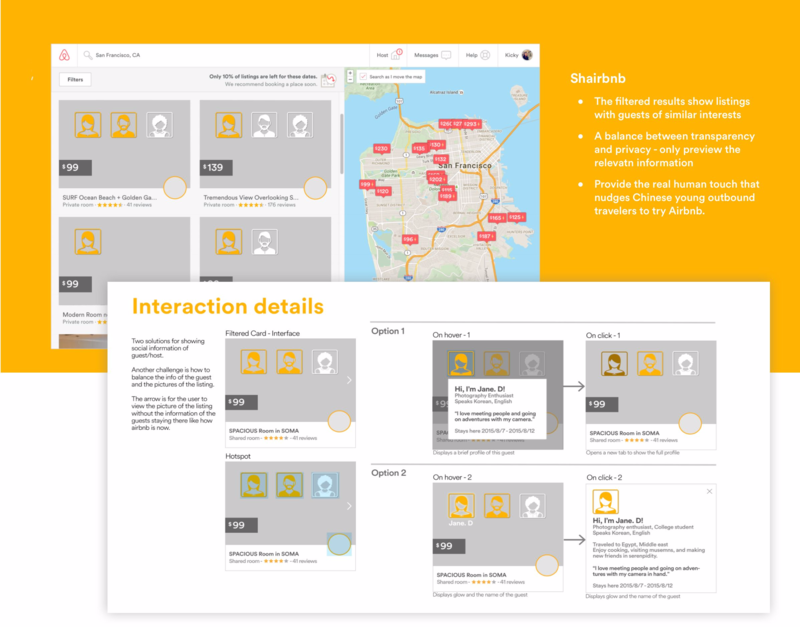 Leveraging the security and trust of a paid platform with reviews and pictures, Shairbnb fulfills travelers social needs by highlighting trust and shared interests. Informed Creativity is extremely important. From learning stats to interpret survey data and conducting interviews to gain first-hand information, I found it very rewarding to ground my creative process in the insights of real customers' behaviors and opinions. 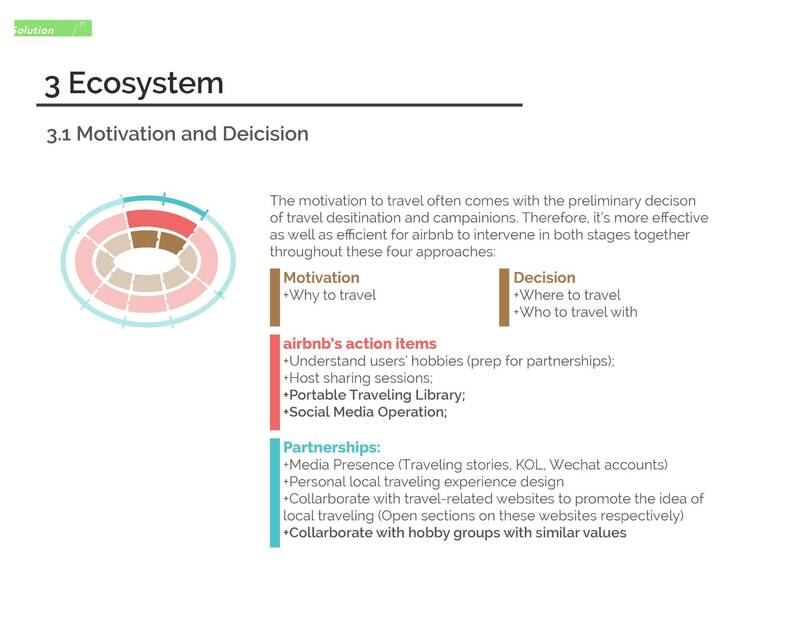 Figuring out how people actually plan, research their accommodation was how it fits in the user flow of travel gave me a holistic view of how to localize Airbnb's product to the social context of the Chinese Market creatively. Design feeds on business acuity and system thinking. Our team lead was very business-minded and always aware of market fit and industry ecosystem. Working with her was a wonderful opportunity to learn about business analysis and system thinking, and it turned out that these two elements were very helpful in coming up with and then fine-tuning product design solutions.